Peer to peer lending is an option people are increasingly turning to, both for obtaining loans and for investment. The principle idea is that investors can decide who they give loans to, based on information provided by the loaner, and the loaner can decide what interest rate they are willing to pay. This new lending environment can give investors higher returns than traditional savings accounts, and loaners better interest rates than those available from commercial lenders. Given the open nature of peer to peer lending, information is becoming readily available on who loans are given to and what the outcome of that loan was in terms of profitability for the investor. Available information includes the loaner’s credit rating, loan amount, interest rate, annual income, amount received etc. The open-source nature of this data has clearly led to an increased interest in analysing and modelling the data to come up with strategies for the investor which maximises their return. In this blog entry we will look at developing a model of this kind using an approach routinely used in healthcare, survival analysis. We will provide motivation as to why this approach is useful and demonstrate how a simple strategy can lead to significant returns when applied to data from the Lending Club. In healthcare survival analysis is routinely used to predict the probability of survival of a patient for a given length of time based on information about that patient e.g. what diseases they have, what treatment is given etc. It is routinely used within the healthcare sector to make decisions both at the patient level, for example what treatment to give, and at the institutional level (e.g. health care providers), for example what new healthcare policies will decrease death associated with lung cancer. In most survival analysis studies the data-sets usually contain a significant proportion of patients who have yet to experience the event of interest by the time the study has finished. These patients clearly do not have an event time and so are described as being right-censored. An analysis can be conducted without these patients but this is clearly ignoring vital information and can lead to misleading and biased inferences. This could have rather large consequences were the resultant model applied prospectively. A key part of all survival analysis tools that have been developed is therefore that they do not ignore patients who are right censored. So what does this have to do with peer to peer lending? The data on the loans available through sites such as the Lending Club contain loans that are current and most modelling methods described in other blogs have simply ignored these loans when building models to maximise investor’s returns. These loans described as being current are the same as our patients in survival analysis who have yet to experience an event at the time the data was collected. Applying a survival analysis approach will allow us to keep people whose loans are described as being current in our model development and thus utilise all information available. How can we apply survival analysis methods to loan data though, as we are interested in maximising profit and not how quickly a loan is paid back? We need to select relevant dependent and independent variables first before starting the analysis. The dependent variable in this case is whether a loan has finished (fully repaid, defaulted etc.) or not (current). The independent variable chosen here is the relative return (RR) on that loan, this is basically the amount repaid divided by the amount loaned. Therefore if a loan has a RR value less than 1 it is loss making and greater than 1 it is profit making. Clearly loans that have yet to have finished are quite likely to have an RR value less than 1 however they have not finished and so within the survival analysis approach this is accounted for by treating that loan as being right-censored. A plot showing the survival curve of the lending club data can be seen in the below figure. The black line shows the fraction of loans as a function of RR. We’ve marked the break-even line in red. Crosses represent loans that are right censored. We can already see from this plot that there are approximately 17-18% loans that are loss making, to the left of the red line. The remaining loans to the right of the red line are profit making. How do we model this data? Having established what the independent and dependent variables are, we can now perform a survival analysis exercise on the data. There are numerous modelling options in survival analysis. We have chosen one of the easiest options, Cox-regression/proportional hazards, to highlight the approach which may not be the optimal one. So now we have decided on the modelling approach we need to think about what covariates we will consider. A previous blog entry at yhat.com already highlighted certain covariates that could be useful, all of which are actually quite intuitive. We found that one of the covariates FICO range high (essentially is a credit score) had an interesting relationship to RR, see below. Each circle represents a loan. It’s strikingly obvious that once the last FICO Range High score exceeds ~ 700 the number of loss making loans, ones below the red line decreases quite dramatically. So a simple risk adverse strategy would be just to invest in loans whose FICO Range High score exceeds 700, however there are still profitable loans which have a FICO Range High value less than 700. In our survival analysis we can stratify for loans below and above this 700 FICO Range High score value. We then performed a rather routine survival analysis. Using FICO Range High as a stratification marker we looked at a series of covariates previously identified in a univariate analysis. We ranked each of the covariates based on the concordance probability. The concordance probability gives us information on how good a covariate is at ranking loans, a value of 0.5 suggests that covariate is no better than tossing a coin whereas a value of 1 is perfect, which never happens! We are using concordance probability rather than p-values, which is often done, because the data-set is very large and so many covariates come out as being “statistically significant” even though they have little effect on the concordance probability. This is a classic problem of Big Data and one option, of many, is to focus model building on another metric to counter this issue. If we use a step-wise building approach and use a simple criterion that to include a covariate the concordance probability must increase by at least 0.01 units, then we end up with a rather simple model: interest rate + term of loan. 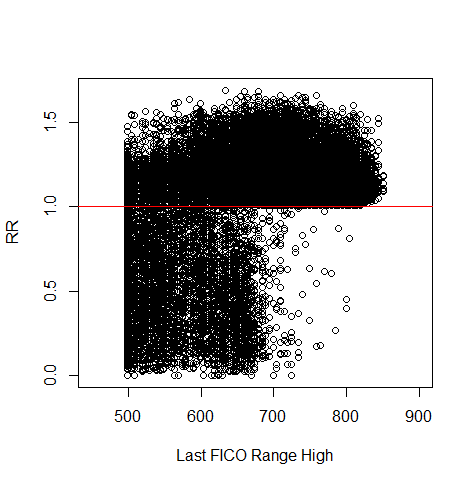 This model gave a concordance probability value of 0.81 in FICO Range High >700 and 0.63 for a FICO Range High value <700. Therefore, it does a really good job once we have screened out the bad loans and not so great when we have a lot of bad loans but we have a strategy that removes those. This final model is available online here and can be found on the web-apps section of the website. When playing with the model you will find that if interest rates are high and the term of loan is low then regardless of the FICO Range High value all loans are profitable, however those with FICO Range High values >700 provide a higher return, see figure below. The above plot was created by using an interest rate of 20% for a 36 month loan. The plot shows two curves, the one in red represents a loan whose FICO Range High value <700 and the black one a loan with FICO Range High value >700. 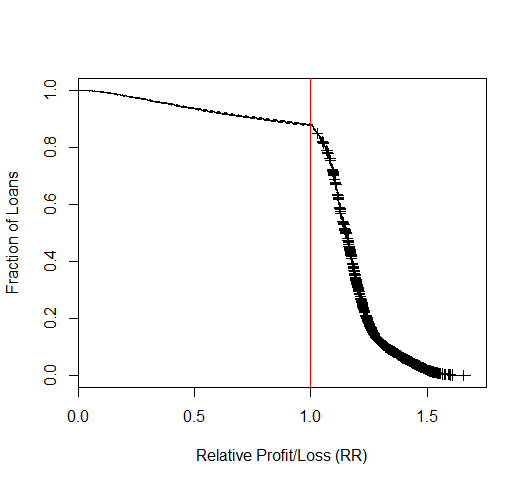 The curves describe your probability of attaining a certain amount of profit or loss. You can see that for the input values used here, the probability of making a loss is similar regardless of the FICO Range High Value; however the amount of return is better for loans with FICO Range High value >700. Using survival analysis techniques we have shown that you can create a relatively simple model that lends itself well for interpretation, i.e. probability curves. Performance of the model could be improved using random survival forests – the gain may not be as large as you might expect but every percentage point counts. In a future blog we will provide an example of applying survival analysis to actual survival data.